On Friday, the EUR / USD pair closed higher. During the day, there were two strong "bullish" impulse. The first impulse was recorded in the Asian session, the second - on the European. They strengthened the euro against the dollar to 1.1324. In the American session buyers retreated from the high to 1.1293. Correction of EUR / USD pair has caused a partial profit taking before the weekend. In April, the consumer sentiment index was 96.9 points compared to 98.4 in March (forecast was 98.0). At 13:00 released the monthly report of the Bundesbank. At 15:30 the US will publish the index of manufacturing activity from the Federal Reserve Bank of New York in April. At 17:30 in Canada will review economic conditions and prospects of development of business of the Bank of Canada in the first quarter. At 19:00 will be the speech of a member of the Monetary Policy Jonathan Haskell. At 20:00 he will make a speech FOMC member Charles Evans. At 23:00 the US will publish data on changes in net and total long-term purchases of US securities by foreign investors in February. On Fridays, expectations have been met. EUR / USD closed higher. Most likely at 1.1324 the upward movement was not completed. Today is Monday - the first day of the trading week. Since in Asia the euro strengthened against the US dollar, then at the auctions in Europe is expected to fall rate EUR / USD to the balance sheet line lb followed up the rebound. 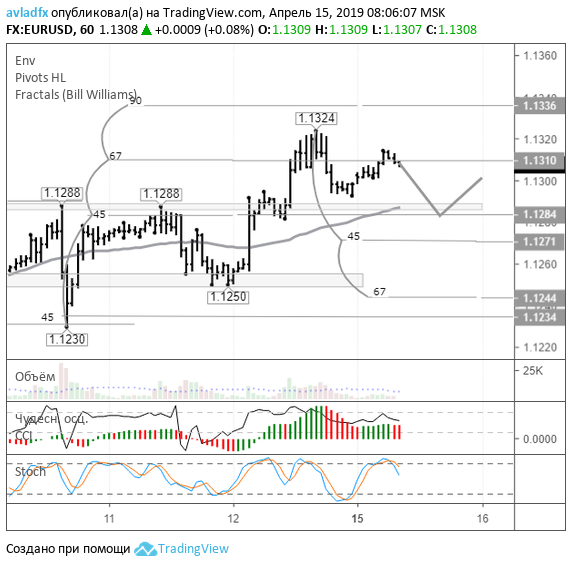 Here we consider the formation of a three-wave formation from 1.1324 to 1.1284. From the support area 1.1280 / 85, you can aim at 1.1365 and 1.1390. The fall of the EUR / USD to 45 degrees significantly reduce the likelihood of further growth in the euro / dollar. There is another alternative: increasing the EUR / USD quotes to the level 1.1337, which will begin a new downward correction to 1.1270.